All of these different names and terms can get confusing! So what are the main differences between the Hypnobirthing Australia course and other courses such as ‘HypnoBirthing – The Mongan Method’ (who appear to be currently rebranding as ‘HypnoBirthing International’) and ‘Calmbirth’? Hypnobirthing Australia™ provides a uniquely Australian course developed by Melissa Spilsted BA, BEd, CHt and drawing upon the teachings of many natural birthing advocates from throughout history and the world. Melissa’s twenty years of teaching/training qualifications and experience, Clinical Hypnotherapy skills and experience, professional voice training and her own personal experience (using a combination of hypnosis/breathing/mindfulness techniques and knowledge for her own three births) were all incorporated into the development of this unique and modern Australian course. The Hypnobirthing Australia course is the most up-to-date, Australian hypnobirth program available and we know that you are going to love it! There are face-to-face or online training options available. In order to provide the highest quality and most relevant modern training materials; Hypnobirthing Australia is independent of any overseas hypnobirthing organisation. We are in no way affiliated with ‘HypnoBirthing – The Mongan Method’ – which is a program designed by Marie Mongan in the USA; and whose course development and practitioner registration are all American based. 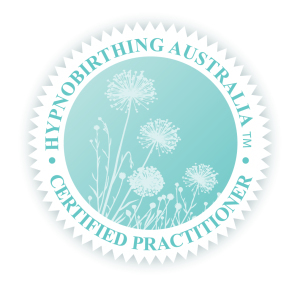 Hypnobirthing Australia™ is the only course which has a legally Australian registered trademark for hypnobirthing. The word ‘hypnobirthing’ is actually a generic term used to describe the combination of hypnosis with birth. You can read more about the history of the word ‘hypnobirthing’ and its use here. 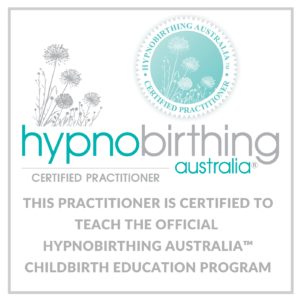 Look for the Hypnobirthing Australia Certified Practitioner badge to identify our highly trained Australian Practitioners teaching this modern and hi gh quality course; or check our practitioner listing on our website. 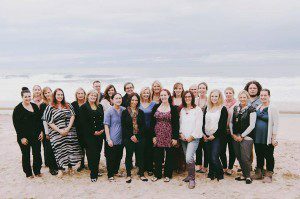 Hypnobirthing Australia Practitioners all complete very comprehensive training (which contains pre-requisites) and require ongoing professional development in order to remain certified and remain on our Australian register. Practitioners consist of mainly qualified childbirth educators, midwives, hypnotherapists, psychologists, medical professionals, qualified doulas and hold qualifications in holistic/health fields. All practitioners are trained to the highest standards by Melissa Spilsted – who is a registered Clinical Hypnotherapist (CHt) and Educator (BEd, BA) in addition to being recognised as Australia’s leading expert in hypnobirthing. The Hypnobirthing Australia practitioner course is an Australian College of Midwives CPD Recognised Activity and we are a recognised training provider with IICT. When parents attend a Hypnobirthing Australia course, they receive: personal tuition by a Certified Hypnobirthing Australia Practitioner; a professionally printed folio of Australian handouts (not generic ones that are suited to other country’s models of maternity care); and several professionally recorded and mastered practice tracks that are spoken with an Australian accent (not American or UK accents), an eBook, practice video and other training materials. The course and techniques are all especially designed for Australian mothers and their birth partners. The modern, up-to-date birthing videos that are shown in classes are very recent and from Australia and New Zealand (no 20 year old videos in our classes). In addition; Hypnobirthing Australia also has a range of modern professionally recorded albums available for download, which can complement hypnobirthing practice and has created a world first program which is specifically designed for parents who require preparation for a caesarean birth. We want ALL parents have access to the same positive preparation for their birth. Our focus is on providing parents with quality, positive, childbirth education – to empower and enjoy! The Calmbirth Course is an Australian course developed by midwife Peter Jackson in 2004. It also teaches mindset techniques, knowledge and tools for calm and gentle birthing; however it does not specialise in the use of hypnotherapy for pregnancy and birth. The Hypnobirthing Australia course absolutely does utilise the techniques of self-hypnosis for removing fear leading up to birth, maintaining a positive mindset throughout pregnancy and for use during childbirth and beyond. We believe that this is a vital component in our preparation and gives us the ‘edge’ in confidence and tools. The Hypnobirthing Australia™ program is unique; it differs from both HypnoBirthing – The Mongan Method and Australian Calmbirth. Our course has been especially designed for Australians, by an Australian with professional qualifications in training and hypnotherapy and personal experience using these techniques during childbirth; and the course structure and content is reflective of this. We strive to ensure that the parents we teach are provided with the most modern, relevant and comprehensive hypnobirthing childbirth education available in Australia today. Our course prepares parents for whatever path their birthing takes. We are flexible, we are relevant, we are modern and we are Australian. Hypnobirthing Australia is the fastest growing childbirth education course in this country – servicing every state and territory of Australia. Areas of service include: Cairns, Innisfail, Townsville, Mackay, Gladstone, Rockhampton, Brisbane, Ipswich, Logan, Gold Coast, Northern NSW, Byron Bay, Central Coast NSW, Newcastle, Hunter region, Maitland, Gosford, Sydney, Wollongong, Canberra, Melbourne, Mornington Pennisula, Phillip Island, Port Lincoln, Adelaide, Esperance, Perth, Busselton, Denmark, Geraldton, Hobart, Darwin and beyond. Demand the best for your baby’s start in life – and experience the Hypnobirthing Australia™ advantage. And remember to look for the original Australian teal certification badge to identify your practitioner as being trained to our own very high standards. Click here to find your closest Hypnobirthing Australia Practitioner and always ensure that you look for the original TEAL SEAL to ensure that you are getting the real deal! If you can’t find a practitioner near you- click here for our online course option. We look forward to helping you to achieve your own beautiful, calm and positive birth!